This dish is for the morning after a big night out on the town. It is the perfect hangover cure. Put the meats, chicken, onion, garlic, bay leaves, and peppercorns in a large stockpot, cover with water, and bring to a boil. Skim off the foam, add the chickpeas, lower the heat, cover, and simmer gently for 2 hours, or until the chickpeas are soft. Meanwhile, bring a large pot of salted water to a boil, add the cabbage and potatoes, and cook until tender, about 25 minutes; drain and keep warm. Ladle the broth from the meats into bowls (keep the meats warm in a little broth) and serve as a first course with the noodles, onion, and peppers. 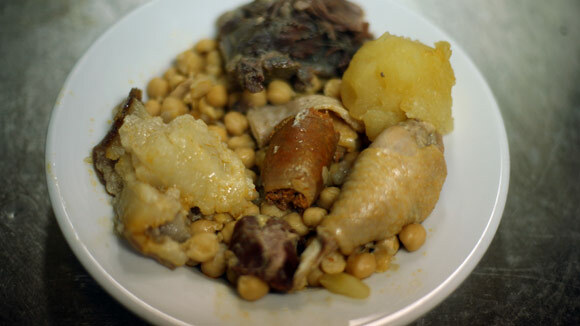 Serve the meats and chickpeas as a second course with the potatoes and cabbage, moistening everything with a bit of broth.